It's that time of year when genealogists should be keeping their beady eyes open for the best special offers, discounts and deals on subscriptions, dna tests, books and all manner of products that we need and covet to facilitate and enjoy our hobby or profession. 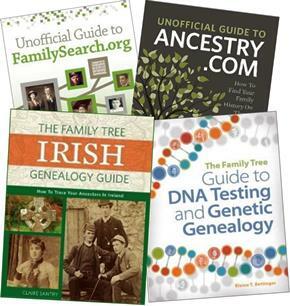 So I feel duty bound to tell you that my book The Family Tree Irish Genealogy Guide: How to Trace Your Ancestors in Ireland, which was published at the end of May, is on special offer (half price, no less) along with a number of other best sellers from the publishers of the USA's Family Tree Magazine. To see the full selection of books and products on special offer, click the image above. Alternatively, if you just want to buy the Irish Genealogy Guide (the 50% reduction brings the price down to just $13.50 plus shipping ($4.95 for USA), you can find out more on its dedicated sales page, or in the blogpost I published just after the book's launch.